Description: The Sword of Oppression is a demonic sword that has a three feet long blade and a half a foot long handle, it is made of a metal that changes colors from red to purple to blue at random times. It is half a foot wide and an inch thick at the blade, it has small parts opened in it so that it can be used to catch a person's weapon and jerk it out of their hand. Effects: Heavier than it looks: The Sword of Oppression is actually much heavier than it looks, so it hits MUCH harder than a normal sword of its kind would. 20% harder. No touching: The Sword of Oppression is able to be summoned back to Laharl if he wills it to. 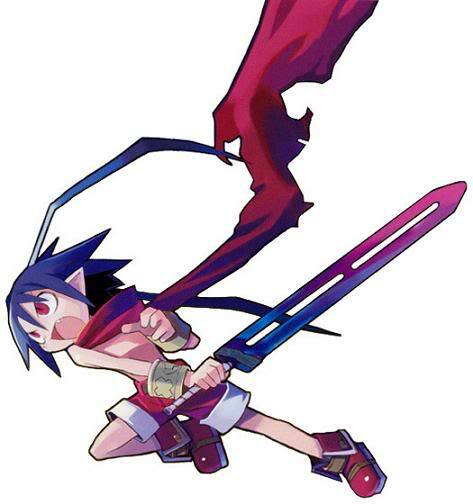 History: The Sword of Oppression was given to Laharl when he became a fully realized demon of hell, the weapon was made by putting all the energy of the oppressed souls of the damned into it. It was then given a bit more power by having Laharl's own Gravity powers pumped into it, the weapon is now Laharls most prized weapon and if anyone was to get near it he would rip them in half with his own two hands. Approved. Sorry for the wait.